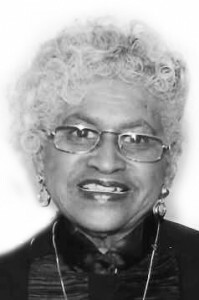 Augustus Funeral Home regrets to announce the passing of Mrs. Barbara Una Josephine Bean. A funeral service to celebrate the life of Mrs Barbara Una Josephine Bean [nee Minors], cherished wife of Arthur Bean, daughter of the late Estina Lottimore and James “Jellico” Robinson, beloved mother of David OB Tucker [Patricia], Derrick Tucker [Linda], Diane Ford [Lynford], Leona “Susie” Landy [Richard], Barbara-Ann “Bobo” Outerbridge, and Donna Swindell [Jeff], will be held at the First Church of God, North Shore, Pembroke Today, 5 November 2016 at 2pm. Interment will follow at Pembroke Parish Cemetery. Relatives and friends may pay their respects at The First Church of God, Today, November 5, 2016 from 1 – 1:55 pm. Also surviving are grandchildren: Vernon, Vernica, David Jr, Jay, Ieisha [Brent], Lisa [Craig], Judah [Sherelle], Jason, Peta [Daniel], Nichole, Ashley and Lauren; 19 great grandchildren; brothers: James, Rudolph and Harry Ford and Mickey Robinson; sister: Eunice Caines; nieces and nephews; special friends: Stanley and Laverne Ingham, James and Gloria Outerbridge, Bishop Vernon G. Lambe Sr. and the First Church of God Family; numerous other relatives and friends; special thanks to the nurses and staff at KEMH, and DH Augustus and Sons Funeral Home. Barbara Una Josephine Bean was predeceased by her siblings: Lilian Derosa, Winifred Bean, Charles Ford and Ena Lee; great-grandson: Job Tucker.